A few months ago, we looked at how you can check a site for safety and malware history with the Google Safe Browsing Diagnostic Tool. To do that, you needed to manually tweak a URL. The tool also only checked Google’s database. For an easier method that not only checks with Google, but two other sources, check out ScanURL.net. 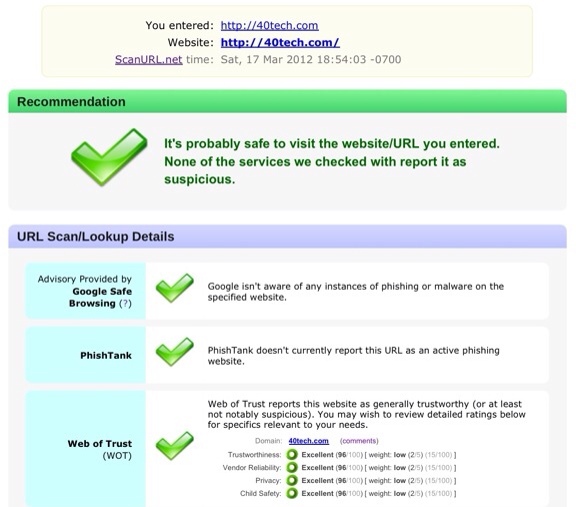 Enter a URL into its search box, and ScanURL pulls data from Google’s API, as well as PhishTank and Web of Trust. It also includes direct links to the Google Safe Browsing Diagnostic Tool for any domain/website, and provides links to other online reporting and scanning services. ScanURL really does a nice job of being a one-stop destination. If you know of any other site scanning tools, let us know in the comments.